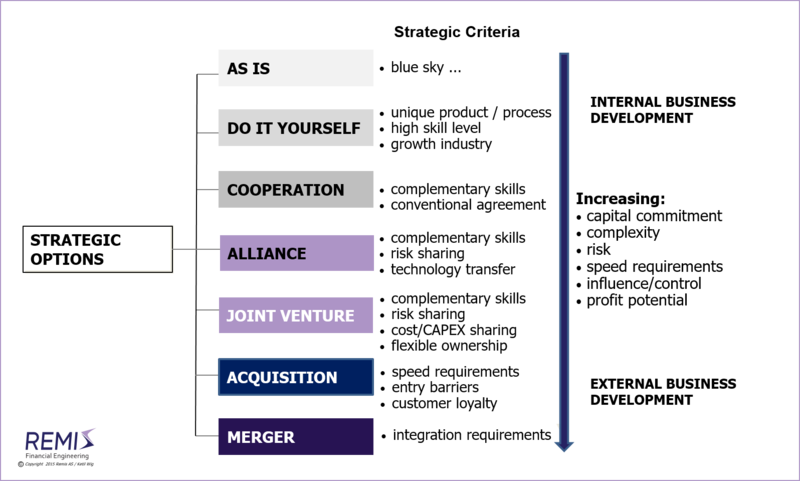 M&A tools, such as acquisitions, divestitures, mergers and strategic alliances, are all business development methods with ”external partners” as a common denominator. Each method has a set of unique characteristics to match the strategic situation for which they are suitable. But business managers are not sufficiently aware of the relationship between the choice of strategy and the proper and applicable M&A tool. Mergers and acquisitions are increasing trends. Why? Let’s start by better understanding why business development through the use of acquisitions, mergers and other types of external collaboration represents a stable and long-lasting trend. Specialization is just another way to emphasize core operations and consequently de-emphasize “non-core”. Primary business units are strengthened (e.g., through acquisitions), whereas non-prioritized operations are outsourced or divested. 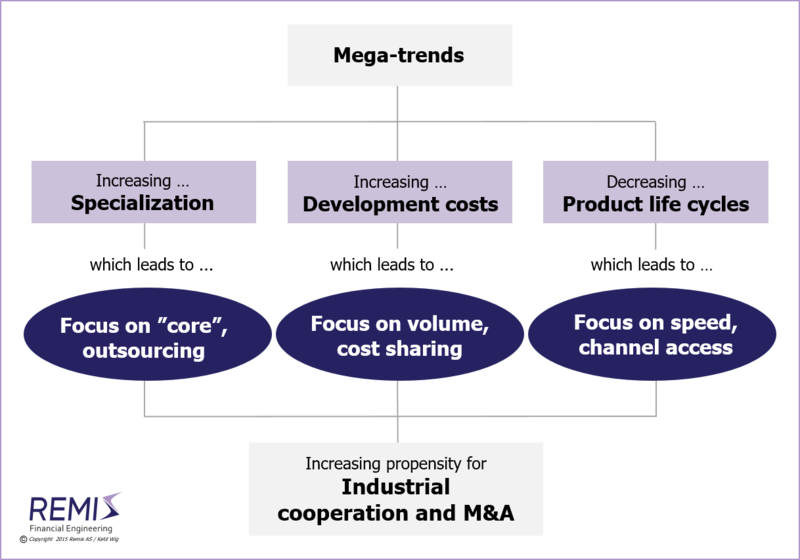 High costs of product development require increased volume (in order to reduce unit costs) or trigger initiatives for cost-sharing; i.e., scale economics through acquisitions and/or risk-sharing through the use of joint ventures or strategic alliances. Shorter product life cycles translate into an increasing focus on rapid commercialization as investments in product development need to be recaptured over a shorter time horizon. This emphasis on speed drives a tendency to adopt strategies of accessing distribution through acquisitions or joint ventures/alliances, or through partnering for quicker “time-to-market” implementation. These three mega-trends all converge into a common propensity to use external cooperation as a key business development tool (i.e. M&A), not due to “general popularity” or timing within the business cycle, but as an answer to a fundamental strategic agenda. What is the common denominator for the various M&A options? M&A should meet real strategic concerns, not managers’ need for enhancing their egos, or financial advisers’ fee motives for suggesting transactions! A unique product or process advantage, an exclusive skill base and strong growth preconditions all indicate a preference for internal business development. However, this DIY strategy implicitly requires access to growth capital. Consequently, this option is also a masked external cooperation, but with financial partners – either in the form of conventional supplier relationships (e.g., with banks) or in more intimate, alliance types of partnerships (e.g., with private equity). 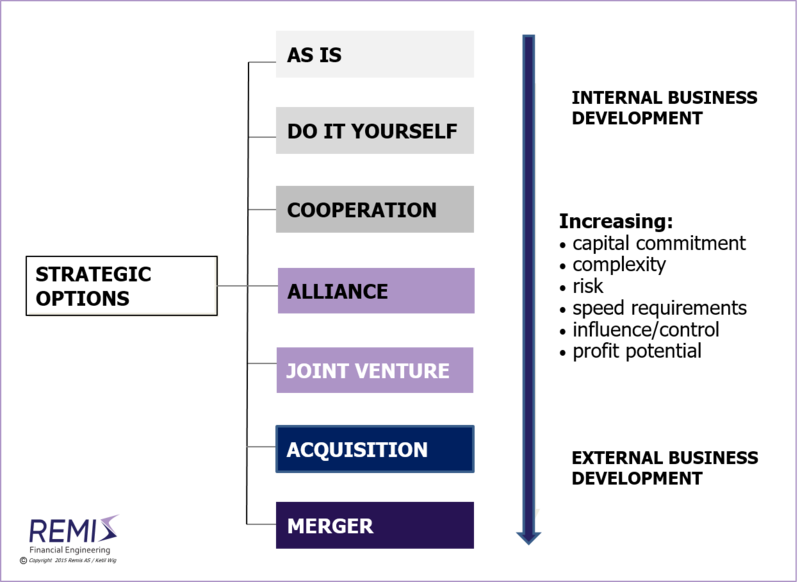 An agreement-based strategic alliance may be expanded with joint ownership, or be based on a jointly-owned, new corporate structure. A joint venture is, by its very nature, an expanded strategic alliance based on risk sharing, mutual financing and flexible ownership structured to fit the situation and the preferences of the complementing partners. Many overseas market entry initiatives apply this method. In principle, you exchange distribution channels and market access for access to products and technology. In sectors with high entry barriers and a need for “assisted market entry,” this method is particularly suited; e.g., within the international telecommunications industry. Many developing nations (e.g., India, Malaysia, China, etc.) insist on using this approach for foreign investments in important national industries. In other countries (e.g., Brazil), requirements for “domestic content” are driving the same joint venture structures. Acquisitions represent higher capital commitments and risk than do strategic alliances; key preconditions should be related to speed requirements or entry barriers. If these characteristics are absent, a strategic alliance may be a preferable alternative – one requiring significantly less capital and lower risk. An under-rated factor is that a necessary prerequisite for a successful acquisition is high customer loyalty to the acquired entity. There are a number of additional pitfalls associated with acquisitions; of primary importance is sufficient emphasis on post-merger integration management (see White Paper #1: Post-Merger Integrations - About Synergies and Poor Judgment). A merger has higher risk than an acquisition, as the acquirer is no longer protected by the limited liability shield of a corporate structure (dependent on the legislation of the region in question). The ownership dilution effect of a merger adds another risk/reward element. But the opportunity for capturing added value as a result of a full integration adds to the profit potential. Consequently, the strategic rationale of a merger should be linked to the need for integration results – which cannot be easily achieved by using lower-risk methods. On these grounds, mergers obviously have their natural place in the toolbox of suitable M&A options – but an emotional preference for “full control” may block strategically preferential solutions in cases where alternative methods of obtaining management impact are available. Beyond the issues of integration and control, mergers are a convenient tool in special acquisition-like situations when it is impossible to agree on anything but relative pricing between two companies. This is particularly relevant in business cycle downturns, when industry consolidation is high on the top management agendas. Take a look at Illustration #2 on the previous page. Negative characteristics such as capital commitment, complexity and risk are increasing as we move down the hierarchy of available strategic options. But so are the positive characteristics of influence/control, implementation ability and profit potential. An often overlooked aspect of structural strategy is that these factors may facilitate a “basket design” approach to situations where the balancing of capital/risk with control/profit potential is of particular value. International investments represent an illustrative case for this type of “portfolio design.” Strategic alliances and joint ventures are suitable for far-away markets which require local partners. Organic expansion through subsidiaries or mergers may be preferred close to the corporate HQ. In between these two scenarios, acquisitions may bridge “the gap” when entry barriers and speed arguments dominate the strategic reasoning. In practice, this is actually the pattern observed in professionally-managed corporations. However, this does not necessarily imply carefully-planned designs! The portfolio characteristics of the M&A toolset do not represent common strategic insight. The main point is that the strategic characteristics of any given situation should drive the choice of M&A method. Surprisingly, this is not the case in a large number of transactions where the “answer” has a tendency to be on the table prior to an available, in-depth understanding of the underlying situation. Transactions have no inherent value! They are merely tools to implement strategy, and each situation has characteristics which should drive the selection of suitable options. Ironically, the advisory industry itself is largely segmented by method (which again is linked to the typical advisory success fee scheme). Therefore, the corporate community needs to pay particular attention to this anomaly when choosing financial advisors. For a full pdf version of this article, see White Paper #2: Strategy and the Proper Use of M&A Tools. Also read the separate articles on Buy-Side M&A, on Sell-Side M&A, on Strategic Alliances and Joint Ventures, on Equity Based Financing of Start-ups, on Financial vs. Industrial Ownership, on Developing High Quality Business Models; on M&A Process Management, on Post-Merger Integrations, and on Synergies and Poor Judgment. See Download Center: White Paper #1: Post-Merger Integrations - About Synergies and Poor Judgment; White Paper #2: Strategy - and the Proper Use of M&A Tools; White Paper #3: Strategy and Implementation - and the Lack of Results; White Paper #5: Buy-Side M&A (mergers and acquisitions); White Paper #6: Sell-Side M&A (divestitures, trade-sales and mergers); or White Paper #7: Should You Choose Financial or Industrial Investors/Owners? ; or White Paper #8: Equity Based Financing of Start-ups and High Growth Situations.